Rousing pro rodeos, extraordinary exhibits, handsome farm animals and steaming delights on a stick are staples at Colorado’s show-stopping summer fairs. 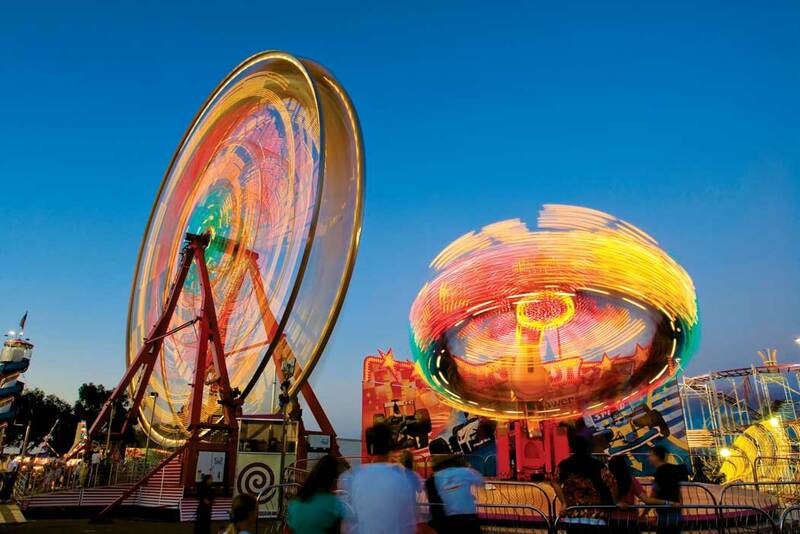 Nearly 60 county fairs take place annually — here are just a few of our favorites. Endearing oddities abound, including a kitten pavilion with a feline celebrity guest, flea circus, unicorn rides, trick pig show (yes, they do impressions) and drag-queen pageant. Watch tractor pulls and auto races; greet some of south-central Colorado’s farm-animal celebrities and kick your heels up in the dance tent. This more than 130-year-old bash boasts rodeos, livestock and horse shows, a Bacon Day with a bacon-donut breakfast and pig painting, and a variety of competitions, including bacon-, watermelon- and Jell-O-eating contests. This Western Slope tradition has dazzled spectators with demolition derbies, pro bull riding and wine-making competitions for more than 120 years. A traditional ranch rodeo, free live music, bares/broncs/bulls, laser tag, livestock auction, chuckwagon dinner, pie-eating, exhibits, petting zoo and Saturday-night dance all keep fair-goers busy. Celebrating its 100th year anniversary in 2018, the Douglas County Fair & Rodeo has a Vintage Marketplace with handmade, artisan and vintage items, dancing horse performances, a stick horse rodeo, mutton bustin' and more. Highlights include the Dog and Pony Show, Kids Pedal Tractor Pulls and Moo U, a guided livestock tour that offers cityfolk insight into the complexities of the livestock industry. The spirit of Colorado’s Front Range shines at this affair, with a farm-to-table dinner, Boulder Craft Distiller Festival and crowd-pleasing shows featuring stunt dogs and ballet on horses. This southern Colorado delight serves up all of a fair’s usual subjects, including fetching farm critters, a truck-and-tractor pull and team-roping competitions. One unique addition to the event is cow-pie bingo, where cows roam a giant bingo board and the square that receives the first cow pie (read: cow dropping) determines the game’s winner. Rodeos, pro wrestling and homebrewing competitions, a celebrity livestock show and oodles of 4-H exhibits keep locals and visitors amused all weekend long. Intrepid cowboys and cowgirls greet thunderous applause at Budweiser Rodeo Area, while a daytime and late-night carnival supplies classic Americana fun. Don’t miss sampling Pueblo’s famed chiles; we recommend the green-chile sloppers, cheeseburger patties smothered in fiery deliciousness.